1 May God be merciful to us and bless us, show us the light of his countenance and come to us. 2 Let your ways be known upon earth, your saving health among all nations. 4 Let the nations be glad and sing for joy, for you judge the peoples with equity and guide all the nations upon earth. 6 The earth has brought forth her increase; may God, our own God, give us his blessing. 7 May God give us his blessing, and may all the ends of the earth stand in awe of him. Then he called the crowd to him and said to them, "Listen and understand: it is not what goes into the mouth that defiles a person, but it is what comes out of the mouth that defiles." Then the disciples approached and said to him, "Do you know that the Pharisees took offense when they heard what you said?" He answered, "Every plant that my heavenly Father has not planted will be uprooted. Let them alone; they are blind guides of the blind. And if one blind person guides another, both will fall into a pit." But Peter said to him, "Explain this parable to us." Then he said, "Are you also still without understanding? Do you not see that whatever goes into the mouth enters the stomach, and goes out into the sewer? But what comes out of the mouth proceeds from the heart, and this is what defiles. For out of the heart come evil intentions, murder, adultery, fornication, theft, false witness, slander. These are what defile a person, but to eat with unwashed hands does not defile." Almighty God, today I celebrate the resurrection of your Son, Jesus Christ, the supreme victory over death that belongs to you alone. I pray that I may, today and in the coming week, act in appreciation of the ultimate gift you have given to me and to all who confess the name of Christ. Make my heart clean within me, I pray, by the power of the Holy Spirit, that my every thought and deed will reflect the graciousness of the salvation given to me, not by my merit but by your love; and that I may continue to learn your word, and accept even what I do not want to hear, and always act in accordance with your will. In the name of Christ I pray, Amen. "A Faith That Won't Fold Up"
He was seven years old when he had to work to support his poor family. At age nine, his mother died. He was 23 when he incurred a huge debt due to a failed business. At 28 and after four years of engagement, he asked his girl friend to marry him but she said “no”. He loved another lovely girl but lost her when she died. At 37, on his third attempt, he was elected to Congress. After two years, he ran for re-election but failed. Adding to a miserable marriage at age 41, his four-year-old son died. At 45, he ran for the Senate and lost. At 49, he ran for the Senate again but lost again. He went through a period of depression amidst all the rejection, criticism and rumors. At 51, he became the President of the United States. We know Abraham Lincoln today as one of the greatest leaders in world history. He set thousands of slaves free by passing a law known as the Emancipation Proclamation. He taught the world that slavery is wrong and that all people should live freely. When the civil war failed to stop his efforts to abolish slavery, his enemies assassinated him for his beliefs. People remember him today as a man who stood firm despite strong opposition. But his struggles formed in him something that very few of us have developed: character, perseverance, faith. He never gave up. Are you having a hard time trusting God amidst your difficulties? Are you disappointed when God seems to be silent or slow in responding to your prayers? Is your faith under pressure and you feel like giving up? Are your problems too heavy for you to hang on? and you are desperate for God’s help? Big Idea: God finds pleasure when your faith persists in spite of pressure. 21 Then Jesus left Galilee and went north to the region of Tyre and Sidon. 22 A Gentile* woman who lived there came to him, pleading, "Have mercy on me, O Lord, Son of David! For my daughter is possessed by a demon that torments her severely." 27 She replied, "That's true, Lord, but even dogs are allowed to eat the scraps that fall beneath their master's table." 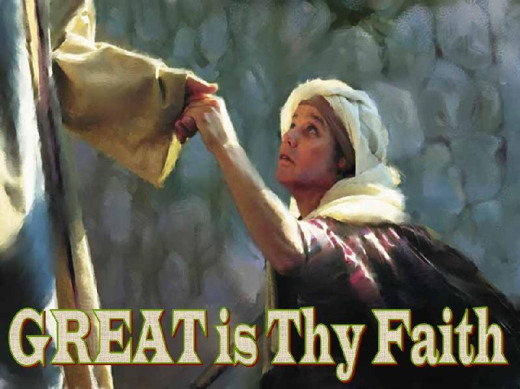 28 "Dear woman," Jesus said to her, "your faith is great. Your request is granted." And her daughter was instantly healed. There are three major barriers that she had to overcome. The people of Israel did not like Canaanites. The Canaanites were the pagans who lived in the Promised Land before Israel came to live there. This passage is about the faith of a Canaanite woman. As a matter of fact, it is about the "great faith" of a Canaanite woman. This would not be such a big deal if Jesus went around applying this compliment loosely, but this woman was unique in two ways. She was the only Gentile woman Jesus healed in Matthew's gospel, and she is the only person Jesus said had "great faith." Compare that with the five times he reminded the disciples of their "little faith," and you can see how unique she is. For the disciples to hear about and witness her great faith is a powerful learning experience for them. Desperation leads to strong faith. The story doesn't begin with us knowing about her great faith; it begins in desperation, where great faith often begins. The Canaanite woman, whose name we never hear, has a daughter whom she describes as "cruelly possessed by a demon." We don't know exactly what this meant, but it easily could have meant she was afflicted with violently insane behavior, like the man who lived among the tombs in Matthew 8, or that she had terrible seizures, like the boy who often fell into the fire in Matthew 17. Whatever her symptoms, her mother was desperate for her to be healed - to be free from this terrible state. Her desperation led to hope - not hope in the folk cures and remedies she probably had tried before, not hope in the best medical advice of the day, but hope in the God of Israel, hope in the Messiah, God's Chosen One. This hope led to a faith without shame. Many times we can be afraid to let our faith be known. Sometimes we don't want to stand out; sometimes we just want to be polite and not "talk religion." Sometimes we just don't want the added scrutiny that comes when people realize we're followers of Jesus Christ. This woman was different; she lived out a faith that came from having nothing left to lose, a desperate faith. She approached this band of disciples and their leader, Jesus. She screamed out to them from a distance, "Have mercy on me, Lord, Son of David!" She didn't just shout, she screamed - her cries as desperate as the faith she had that Jesus was the One who could make a difference. She didn't care that the disciples didn't approve. She didn't care, even as a woman approaching men who were strangers, that she would stand out like a sore thumb. She didn't care about the things that often make us ashamed. She had the faith of a desperate mother - a faith without shame. This should make us think about our faith. Does it come out of desperation? Does our faith rise out of a confidence that Jesus is the only One who can bring meaning to our lives, the only One who can bring true spiritual and emotional healing, the only One to whom our lives are worth devoting? Or, is our faith just a casual thing we do because it's expected? The Canaanite woman's faith was without shame because she knew Jesus was her only hope and she didn't care what others expected. “Faith is not merely your holding on to God--it is God holding on to you. He will not let you go!” -- E. Stanley Jones. She cried out, but Jesus didn't say a word - complete silence. She went to Him and made her plea and "He answered her not a word." He practically ignored her, yet He was testing her faith. He knew what was in man, He knew that she had faith. He was waiting for her faith to find full expression. Some of the greatest lessons of faith are learned when God appears to be silent when we are desperate. Over and over the woman cried out to Jesus for mercy. But He did not answer her, not even a word. Not one word of acknowledgment was uttered. Not even a "Not now," "I’ll speak with you later," "I hear you, let Me think on it," was said. Nothing but divine silence met the pleas and cries. All of us want to be listened to when we speak. Nothing can spark anger in us quicker than to feel snubbed by a relative or a friend when we are speaking. Even if someone does not agree with what we say we at least want to be acknowledged! Yet here was a lady that felt in the depths of her own soul the desperation of her daughter’s demon possession, and in her crying out to Jesus Christ she found only silence. Why was Jesus silent to her pleas? His silence tried her faith, but did not conquer it; she pleaded still. The Lord responded the way He did to her, not to destroy her faith, but to develop it. He had a purpose in His silence. The effect was to develop, strengthen, and manifest her faith. His silence was not without purpose, and certainly not out of unconcern for this woman’s need. She was not discouraged to the point of giving up by our Lord’s seeming denial. She waited and held on, believingly. At this point, the disciples (and many of us) get a little uncomfortable. They shuffle their feet a little, finally speak up and say, "Jesus, umm…maybe You could just heal her daughter and she would leave us alone. You know, it's actually embarrassing us to see her acting like this, and You know what people will say seeing her following us around." To this Jesus said, "I was sent only to the lost sheep of the house of Israel." How do you think they would have responded? Would they have been as shocked as we are that Jesus said this? Or would they have been thinking this: "Well, yeah Jesus…we don't like Canaanites either, but she's driving us crazy." We then see something more about her faith. Not only does she have faith without shame, but her faith was without fear. She was not afraid of Jesus or the disciples. She threw herself down at Jesus' feet in total worship. With nothing to lose, she showed a relentless dependence on Jesus. Without shame and without fear, she fell at Jesus' feet and asked again, "Lord, help me." Is this the kind of utter devotion we have, or are we afraid to pray and ask God something because we might be told no? This woman didn't let Jesus' lack of response stop her. On top of a faith without shame or fear, she showed a faith without stopping, a faith that wouldn't quit. As she bowed down at Jesus' feet, He told her something very strange. He said, "It is not fair to take the children's food and throw it to the dogs." Everyone there knew what Jesus meant, the disciples and the woman. He was saying in effect: It isn't good to take the blessing meant for Israel and give it to the Gentiles. The woman said, "Jesus, master, as always You're right, but even the dogs eat from the crumbs that fall off the master's table." In other words, on her face in worship at the feet of Jesus the woman said, "Lord, I know Your blessings are for the entire world. I know Your blessing is so great that I'll gladly take the leftovers and be satisfied." At this final response from the woman whose faith won't quit, I can see the scene. 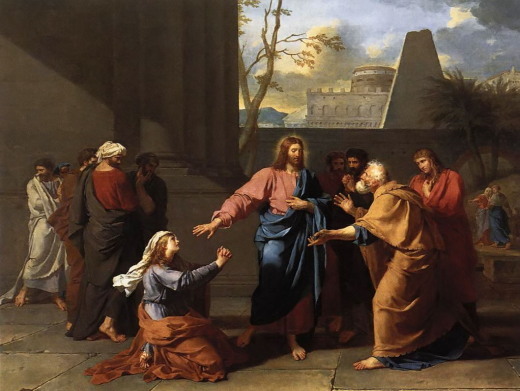 Jesus' serious face broke into a smile; He reached down, grabs her by the hands, helped her off her feet, looked her in the eye and said, "Great is your faith woman, your daughter is healed!" The Lord was testing her faith, and she passed the test well. This is where this particular story ends. We don't know what the disciples were thinking. Did Jesus remind them of what He previously taught? In chapter 7, Matthew wrote, "Ask, and it will be given you; search, and you will find; knock, and the door will be opened for you." Here, from one they never would have expected, the disciples saw this kind of faith lived out. They got a living lesson on asking, seeking, and knocking. They saw great faith embodied, a faith that didn't quit with asking, a faith that wasn't ashamed to seek diligently after Jesus, a faith that wasn't afraid to keep knocking even in the face of no response. Do we have a faith that won't quit, or do we have a faith that gives up when we don't see a quick response? The disciples left that place after having seen a faith that wouldn't quit, a faith they imitated as they spread the gospel later on in the face of persecution. The tradition of the church tells us nearly every disciple died a martyr's death for his or her faith in Christ. Could it be that the great faith they carried until death was learned from the Canaanite woman? May God grant us such faith, a faith so great that it won't give up even in the face of uncertainty, a faith so great that it seeks Jesus Christ relentlessly, a faith so great that it believes God's blessings are too big for one nation, a faith so great that it never quits. May God grant us the faith of a woman who had nowhere else to turn except to worship at Jesus' feet. Bethany Hamilton has become a source of inspiration to millions through her story of faith, determination, and hope. Born into a family of surfers on February 8, 1990, on the island of Kauai, Hawaii, Bethany began surfing at a young age. At the age of eight, Bethany entered her first surf competition, where she won both the short and long board divisions. This sparked a love for surf competition within her spirit. At the age of thirteen, on October 31, 2003, Bethany was attacked by a 14-foot tiger shark while surfing off Kauai’s North Shore. The attack left Bethany with a severed left arm. After losing over 60% of her blood, and making it through several surgeries without infection, Bethany was on her way to recovery with an unbelievably positive attitude. Lifeguards and doctors believe her strong faith in God helped get her through the traumatic ordeal. Miraculously, just one month after the attack, Bethany returned to the water to continue pursuing her goal to become a professional surfer. In January of 2004, Bethany made her return to surf competition; placing 5th in the Open Women’s division of that contest. With no intention of stopping, Bethany continued to enter and excel in competition. Just over a year after the attack she took 1st place in the Explorer Women’s division of the 2005 National Scholastic Surfing Association (NSSA) National Championships – winning her first National Title. In 2007, Bethany realized her dream and turned pro. God calls us to have a faith that won’t fold up... a faith that does not quit. Scripture taken from the Holy Bible, New Living Translation, copyright © 1996, 2004, 2015 by Tyndale House Foundation. Used by permission of Tyndale House Publishers Inc., Carol Stream, Illinois 60188. All rights reserved. Sermon contributed by Michael Cariño on Jan 2, 2017. What in your life will last longer than riches? New International Version (NIV) Holy Bible, New International Version®, NIV® Copyright ©1973, 1978, 1984, 2011 by Biblica, Inc.® Used by permission. All rights reserved worldwide. New Revised Standard Version Bible: Catholic Edition, NRSVCE® copyright © 1989, 1993 the Division of Christian Education of the National Council of the Churches of Christ in the United States of America. Used by permission. All rights reserved. 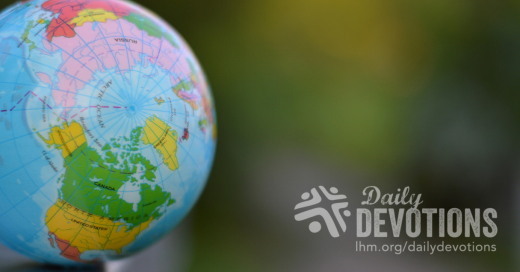 LHM Daily Devotion - August 20, 2017 "Time to Pray"
It is two o'clock in the morning when the phone of the Cristo Para Todas Las Naciones rings in Paraguay. The Paraguay director picks up the phone. A voice on the other side says, "Pastor, can you pray for my son who had a serious motorcycle accident and is in the hospital?" Do you know when to pray? Should we have a proper time to pray? Should we pray once a month or only when there is worship and Bible study? Or should we pray only at a fixed time like some religions do? We can find Jesus' answer to many of these questions if we look at what He said to His disciples the night He was delivered. He encouraged: "Watch and pray that you may not enter into temptation. The spirit indeed is willing, but the flesh is weak" (Mark 14:38). Are you among those who think prayer is like a pre-paid cell phone, which has a balance limit? How many times do you pray? And how many times do we pray as a Christian church? Writing to the Thessalonians, St. Paul addressed many such questions when he said, "Pray without ceasing, give thanks in all circumstances; for this is the will of God in Christ Jesus for you. Do not quench the Spirit" (1 Thessalonians 5:17-19). So there we have it: Christ's redeemed pray not only when something bad happens to them or when they are afflicted and sick. We who have been cleansed of our sins by the Savior's precious blood are glad to pray in every situation and circumstance. My dear Daily Devotioner, by now you realize our hearts ought to be filled with gratitude for physical blessings, spiritual blessings, and the love of God shown to us at Jesus' cross and empty tomb. Proof of this is that when Jesus was praying, heaven was opened, and the Holy Spirit descended upon Him in the form of a dove. Luke 3: "And the Holy Spirit descended on Him in bodily form, like a dove; and a voice came from heaven, "You are My beloved Son; with You I am well pleased (Luke 3:22). THE PRAYER: Dear God, may Your love teach us to be grateful children who consider themselves blessed to stand in Your presence. This I ask in the Name of Jesus Christ. Amen. Biography of Author: Today's international devotion was written by a volunteer who wants to remain anonymous. The volunteer dedicates his life to the service of Christ seven days a week through the Cristo Para Todas Las Naciones Ministries Center in Paraguay. Lutheran Hour Ministries (LHM) in Paraguay, known locally as, "Christ for All the Nations," opened its first ministry center in 2000. Since Paraguay is such a remote area, LHM-Paraguay uses Bible Correspondence Courses (BCC) to reach out with the Gospel to as many people as possible. In various communities, small groups of 12 to 30 people often gather to study the Bible and discuss how it relates to their lives. Another way LHM-Paraguay distributes its message is over the radio. Programs are being broadcast over four radio stations throughout the country, including the capital of Asunción.